Today I would like to introduce you geek heads a great product that I came across with. Credit Card Knife Survival Life!!! 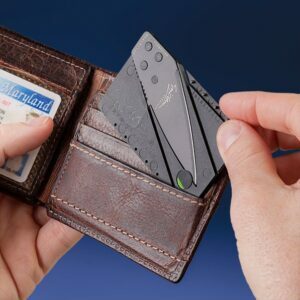 You may have seen this around before or not, but let me shortly define what this baby is: It’s a credit card which can actually transform itself into a Pocket Knife! And honestly, it’s actually a great tool that many people (maybe including you) need. You may have heard of the existence of this cool and useful gadget before, which is hard to forget once seen. It would have been a sin not to include it in a site where geek items can be found. We will be checking out what this little dangerous baby is all about. You will be reading about it’s features, system of use and the comforts that comes with it. So, keep reading! But there is of course a warning part first. 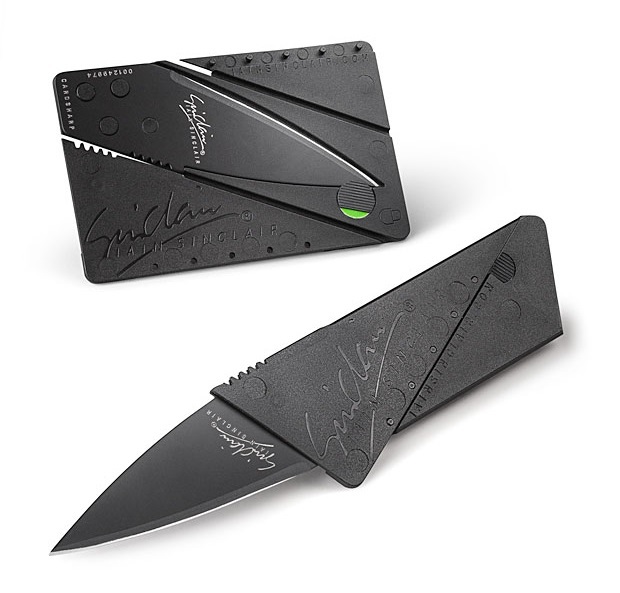 If you’re a geek who’s a little ninja minded, one of the first things you could be thinking after you saw Survival Life Credit Card Knife is all the sneaky actions you can carry out with this credit card sort of knife. Sneaking into high security facilities may seems like a great idea for you (but let’s just keep that as an idea for now). DON’T CONTRIBUTE ANY ACTIONS LIKE THAT. Because it’s not just a simple toy. It’s an actual knife with a sharp edge and it can really harm or even kill a living person or animal if such a thing is meant to. The manufacturers and this site is not responsible for any actions you contribute with the credit card knife and we really don’t want you to use it on any living being! Just a little warning..
Now, else of coming handy in some assasin mambo jambo, Credit Card Knife is actually a very useful tool in your daily life. For the ones who don’t want to or aren’t comfortable with carrying a seperate pocket knife, this can be the best solution for you and you’ll see why. Now let’s get to know this little credit card of death. Did you ever need a knife or a sharp edge but couldn’t find it anywhere?? I know you’ve been in this situation because many of us (including me) face this situation time to time. Be it a package that has to be opened or any other task you need to accomplish with a blade, it is always a knife that has to be used. And trust me, these situations can be pretty annoying, especially if you have to travel a few storeys to find a simple little knife. Some of my friends are the types who don’t like to carry sharp weapons. After introducing them the Credit Card Knife they didn’t hesitate a second to buy one for themselves. Almost all of them got their credit card knife and thanked me for introducing it to them. 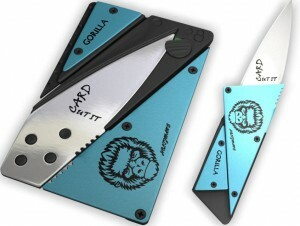 And I must remind you that Survival Life is not the only manufacturer who produces the Credit Card Knife. It may be started with them or they may be majorly known to many people with their great invention but there are other manufacturers who manufacture the same credit card knife and some of them probably do it better than them. It is ultra slim! And by ultra slim I mean mm. Just the thickness of 2 credit cards combined. It can fit anywhere in your wallet or your pocket. It converts from a credit card to a knife just in seconds. You will have a knife just in seconds from out of nowhere. Well okay, out of a credit card. The blade is made from surgical stainless steel blade and it’s really sharp. It is good to know that it won’t get rusted. And it’s very durable. It has a protective hand guard. You’ll notice it when the card converts into it’s knife form. It prevents the blade from slipping and gives you a grip. Waterproof Locking Mechanism. It prevents the blade from opening accidently. It can be locked and unlocked with just a simple little twist. They offer a life time “no questions asked” money back guarantee! That’s how much they trust themselves. It comes in different colors. You can pick the most attractive one to you and amaze people when there’s a knife needed. The blade is made of steel and it can set off metal detectors. So don’t try to hijack some plane with it. The blade is known to be super sharp, that’s why you better care handling it. It’s not just a toy, it becomes an actual weapon in your hands, so be careful. Are Users Happy With It?? These user reviews are the real deal. These are reviews which are writtten by actual users and purchasers. That’s why they show real guidance when you’re picking an item. 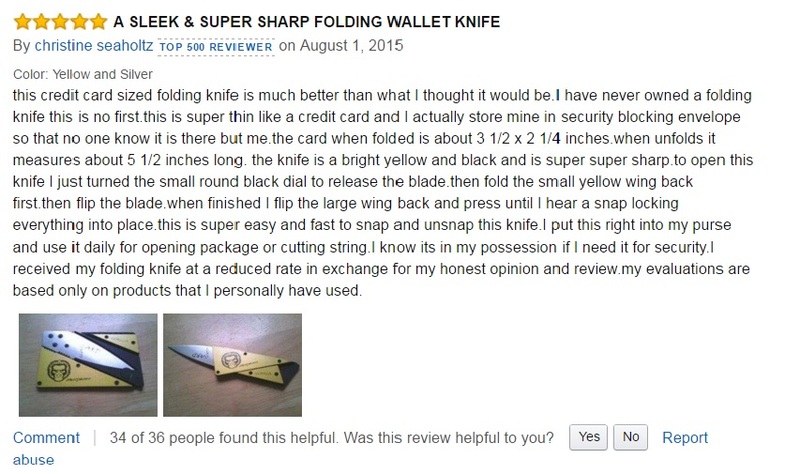 Credit Card Knife has 4.5 stars out of 5 from 364 customer reviews! That’s massive! It means that no one would regret getting a credit card knife. Where Can You Get One?? 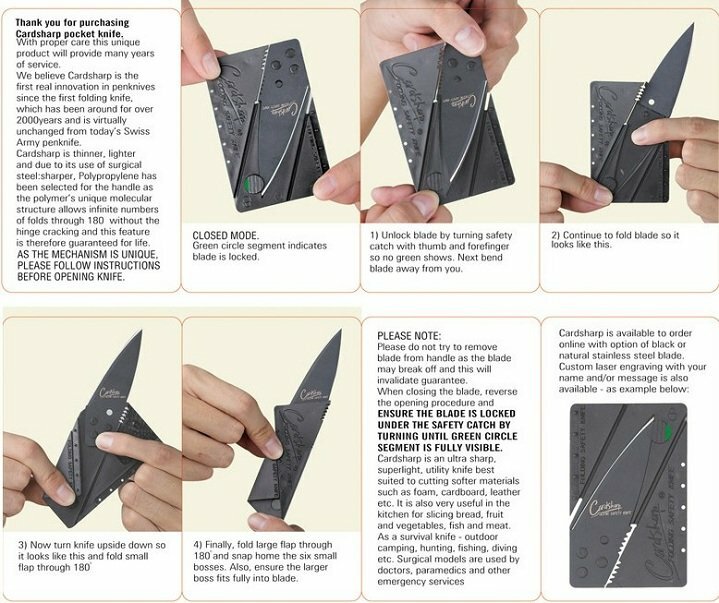 Now you know every detail about the credit card survial knife. Hope that you found what you are looking for here. We checked out the main features of credit card knife and now you know where you can get one for yourself. You’ll never have to look around for a knife when it’s most needed because you’ll know that you always have one inside your wallet. If you have any questions to ask or anything you would like to state, please leave comments in the comments section below. Your comments are HIGHLY appreciated. If you would like to contact directly, you can mail to santa@santagotgeek.com. Don’t forget to check out our other content and spend some time around! See you soon and keep in touch!!! Great site right up my street, so Darth Vader was a geek as well. Not sure i want the social media links in two different places on all pages, glad there was a fold away function nice innovation, I may try this on my site. Good content are you going to connect to affiliate programs and start a shop as well think that would be great, research these gifts and I can buy them in one place. Will be coming back keep up the good work. Glad that you liked the site) Feels great that hard work pays off. Don’t know about the shop thing, not thinking yet about something like WooCommerce. But maybe in the future why not. It certainly is great espacially for campers and nature addicts. It is one of my favourite items and it’s a perfect gift! That article â€œCredit Card Knife Survival Life â€“ The Modern Day Survival Gadgetâ€ is amazing! I never new those things existed outside the James Bond movies. Does it come with a sharpener? If not, do I sharpen it the traditional way I sharpen a regular knife? These things actually exist) Maybe the ideas have evolved from movies like James Bond, but they’re pretty cool either way. Thanks for your interest) Keep in touch!. Thank you Sara) I’m really glad that you liked it. And thanks for the video by the way, I adore Vimeo and i may change the video in this article with a more eye-candy one like yours) See you around!